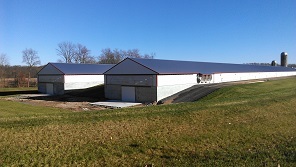 Red Barn assisted with the necessary permitting for a client to construct a new poultry operation in East Hanover Township, Lebanon County, Pennsylvania. 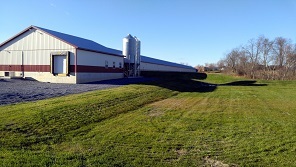 The construction consisted of two 46’ x 532’ poultry barns, 46’ x 28’ manure storages, 46’ x 32’ eggroom, 12’ x 96’ corridor, gravel driveways, gravel pads, and stormwater management controls. 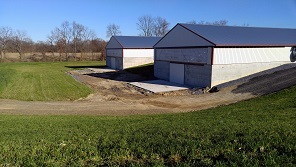 The site was visited by Evin Fitzpatrick of Red Barn Consulting, Inc. and a topographic site survey was performed on June 19, 2015. 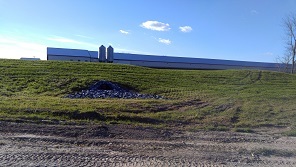 Stormwater management controls have been designed for the Poultry Operation in accordance with the DEP NPDES stormwater management requirements and the Lebanon County Residual District requirements within the Lebanon County Subdivision and Land Development Ordinance. 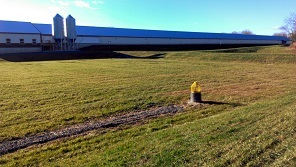 The entire site is located in Swatara Creek Watershed. 2. Filter sock will filter sediment-laden runoff from the project site. 3. 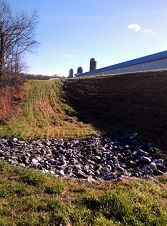 Swales will be lined with erosion control matting and permanently stabilized. 4. 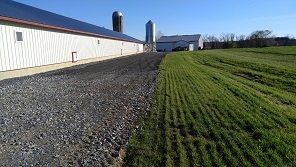 Permanent seeding and gravel will be used to stabilize all disturbed areas.